aFrom the Departments of Radiology (A.W.K., A.O., M.S.L., E.N.M., T.A.H., J.D.C., A.J.N. )cNeurology (A.J.N. ), Northwestern University Feinberg School of Medicine, Chicago, Illinois. SUMMARY: Cardiac implantable electronic devices are frequently encountered in clinical practice in patients being screened for MR imaging examinations. Traditionally, the presence of these devices has been considered a contraindication to undergoing MR imaging. Growing evidence suggests that most of these patients can safely undergo an MR imaging examination if certain conditions are met. This document will review the relevant cardiac implantable electronic devices encountered in practice today, the background physics/technical factors related to scanning these devices, the multidisciplinary screening protocol used at our institution for scanning patients with implantable cardiac devices, and our experience in safely performing these examinations since 2010. MR imaging examinations are being performed with increasing frequency worldwide, with nearly 35 million scans performed annually in the United States alone.1 More than 1.8 million individuals in the United States have a cardiac pacemaker or implantable cardioverter-defibrillator (ICD), both of which fall under the larger umbrella term of cardiac implantable electronic devices (CIEDs). Traditionally, these devices have precluded patients from undergoing MR imaging examinations.2⇓⇓–5 More recently, “MR imaging–conditional” CIEDs have been developed, which contain components that can be safely placed in an MR imaging scanner.6 Despite the development of these devices, many patients with a CIED that is not MR imaging–conditional remain and would benefit clinically from an MR imaging examination. To date, a growing body of research suggests that CIEDs that were traditionally considered MR imaging incompatible can be scanned safely when certain precautions are taken.2,7⇓⇓–10 Despite these published reports, many institutions still do not have protocols in place to scan patients with CIEDs. In this article, we will begin by providing an overview of the types of CIEDs encountered in practice today as well as some of the relevant physics and technical factors related to scanning these devices. Then we will discuss the multidisciplinary protocol used at our institution for scanning patients with CIEDs, including initial cardiac evaluation/cardiac clearance, cardiac monitoring during scanning, and the relevant postscan evaluation and clinical follow-up. Finally, we will outline the number and types of procedures performed at our institution since 2010 and any complications encountered during this period. As described above, a CIED may have ≥1 cardiac lead. If only a single lead is present, it is usually implanted into either the right ventricle or right atrium. When a 2-lead CIED is present, the leads are typically implanted into both the right atrium and right ventricle, with the latter lead performing both pacemaker and defibrillator functions. Biventricular pacing, also called “cardiac resynchronization therapy,” uses a third lead, which is usually implanted in a ventricular branch of the coronary sinus to capture the left ventricular epicardium at the same time as right ventricular activation to improve synchronization between right and left ventricular contractions.11⇓–13 Regardless of whether the patient has a pacemaker device or a combined pacemaker/defibrillator and irrespective of the number of device leads, a CIED is programmed to operate in a specific pacing mode chosen to provide the greatest benefit to the patient. In the simplest terms, the pacing mode is denoted with a 3-letter code (eg, DDD or VOO), with both the letter position and letter type describing specific pacemaker functions. Fourth and fifth letters can be added to this code; however, discussion of these is beyond the scope of this article. The first letter describes which chamber is being paced, the second describes which chamber is being sensed, and the third describes how the pacemaker responds when a beat is sensed (Table 1). While the first 2 letters in this code are self-explanatory, the third letter requires a brief discussion. During “inhibition” mode, a pacemaker will inhibit ventricular pacing when a heartbeat is sensed. “Trigger” mode indicates that the device will trigger a ventricular pacing stimulus every time an atrial beat is sensed. Finally, “dual” mode indicates a more complex situation in which the device responds to a sensed beat in the atrium or ventricle by inhibiting pacing output to that chamber and simultaneously delivering a stimulus to the ventricle after the atrial beat is sensed. This scenario only arises if there is no inhibition of the pacemaker by an intrinsic beat originating in the ventricle. For example, when a patient's device is programmed in DDD mode, the device may operate in 4 possible ways: pace both chambers, sense only in both chambers without pacing, pace the atrium with natural conduction to the ventricle, or pace the ventricle following an intrinsic atrial beat. Finally, asynchronous (also known as “fixed”) pacing can be used as a more general term to describe any scenario in which cardiac pacing is not inhibited by intrinsic cardiac activity.13 For instance, in VOO pacing, the ventricle is paced at a fixed rate with no device sensing, so there is no capacity to inhibit/trigger based on sensed activity. In 2011, Nazarian et al2 reported their prospective experience following 438 patients with pacemakers and ICDs who underwent 555 MR imaging examinations. This study included thoracic examinations but excluded pacer-dependent patients with ICDs. The authors reported power-on resets in 3 of 438 patients, none of which were associated with long-term device dysfunction. With regard to lead parameters such as sensing, impedance, and capture thresholds, no device in this study required device revision or reprogramming due to any parameter changes. However, right ventricular lead–sensed amplitude was lower and right ventricular capture thresholds tended to be higher both immediately following MR imaging examinations and at long-term device follow-up. These lead parameter changes were most strongly associated with thoracic MR imaging examinations, though they were not clinically important.2 Dandamudi et al10 evaluated 58 patients with non-MR imaging–conditional CIEDs who underwent only cardiac and thoracic spine MR imaging examinations. No clinically important parameter changes, arrhythmias, device mode changes/electrical resets, or battery depletions were found following the MR imaging examinations in this study. More recently, the largest study to date, The MagnaSafe Registry (http://magnasafe.org/), examined 1500 nonthoracic MR imaging scans in patients with non-MR imaging–conditional CIEDs.8 In this study, device interrogation following the MR imaging examinations assessed parameter changes such as a decrease in battery voltage, an increase in pacing threshold, pacing or shock lead impedance change, and a decrease in P- and R-wave amplitudes. This study found that no patient who was appropriately screened and reprogrammed following the procedure had device or lead failure. The authors also noted that changes in device settings were uncommon and not clinically important. Of note, 1 case of the 1500 (in the subgroup of 500 patients with ICDs) did require device replacement due to device failure from inappropriate programming during the MR imaging examination. Additionally, there were 6 cases of partial electrical reset, which was corrected following the MR imaging examination during standard device reprogramming. Finally, 6 patients developed atrial fibrillation/flutter, though 5 of these patients had a history of paroxysmal atrial fibrillation and the sixth patient had resolution by 48 hours. For a CIED in a specific patient to be correctly labeled as MR imaging–conditional, the entire device, including the pulse generator, pulse generator software, and cardiac leads, must all be constructed from MR imaging–conditional components produced by the same manufacturer. In addition, each manufacturer requires that other specific conditions be met. These are related to magnet field strength (1.5T magnet only), time when the CIED was implanted (>6 weeks before the MR examination), body part to be scanned, specific absorption rate (SAR; maximum of 2 W/kg), and so forth.21,24,25 Please see Table 2 for a list of currently approved MR imaging–conditional CIEDs. Despite the wide availability of MR imaging–conditional CIEDs, non-MR imaging–conditional devices are still implanted in clinical practice today. In certain instances, non-MR imaging–conditional devices are implanted for cost reasons. Non-MR imaging–conditional generators also continue to be installed in patients who have non-MR imaging–conditional devices, in which the leads are intact and the device generator must be replaced due to battery depletion. When an object is placed in an MR imaging scanner, hydrogen atoms tend to align either with or against the static magnetic field, B0. A rotating radiofrequency pulse can then be applied that contains 2 orthogonally oriented components, the magnetic field (B-field or B1) and the electric field (E-field). The positive component of the B-field tilts the hydrogen atoms into the transverse plane, where the atoms rotate and produce a signal detected in the receiver coil. As described previously, this RF pulse deposits energy in the tissue and results in tissue heating.4,21,28,29 The term that has been traditionally used to describe the RF power that is absorbed per unit mass of an object is the “specific absorption rate.” SAR is expressed in watts per kilogram and is related to the square of the main magnetic field, square of the flip angle, square of the patient radius, patient conductivity, and the RF duty cycle.29 “Duty cycle” refers to the percentage of time that the RF pulse is “on” and can be shortened by lengthening the TR. While the focused examinations performed in clinical practice (ie, MR imaging of the brain) produce a local SAR value in the region being scanned, SAR is typically averaged over the entire body, generating a single whole-body SAR value. When performing an MR imaging examination, the operator (ie, technologist) can choose between scanning in normal and first-level modes. In normal mode, the whole-body SAR is limited to 2 W/kg. In first-level mode, there is an allowed maximum SAR of 4 W/kg. 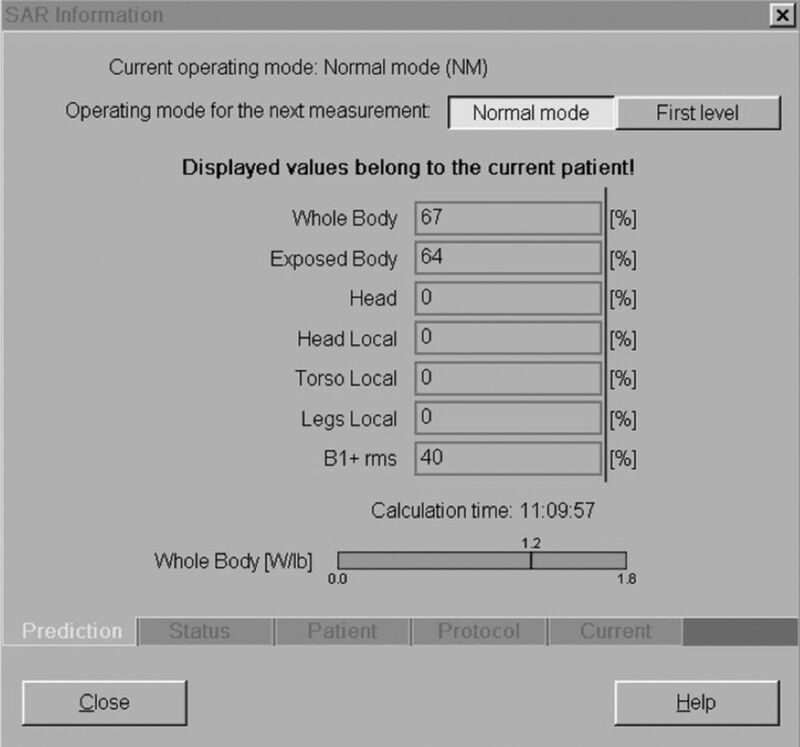 The scanning mode is selected at the MR imaging scanner console (Fig 1). B1+RMS values are also displayed in this region. Normal versus first-level mode: normal level only for neuroradiology. SAR information panel at the scanner console for a sagittal STIR TSE acquisition of the lumbar spine. Any neurologic imaging study that can be run on a 1.5T magnet, including echo-planar imaging, can be performed in a patient with a CIED, as long as the examination is performed in normal operating mode. Image courtesy of Charles Fasanati. At our institution, all MR imaging in patients with pacemakers is performed at 1.5T, and the pacemaker must have been in place for >6 weeks. Examinations are typically performed with receive-only coils. Although we have used head transmit/receive coils in the past to minimize patient RF exposure, we are not currently using head transmit/receive coils because these coils do not allow the use of parallel imaging in patients with non-MR imaging–conditional CIEDs. Not using parallel imaging would lengthen and thus may degrade the examination. Many patients are also undergoing concurrent MR imaging of the spine for which we use the body transmit coil because there is no body transmit/receive coil available. We believe that it would be contradictory and overly complicated to use a head transmit/receive coil followed by the body transmit coil and spine receive coil for imaging of the thoracic spine, which is the portion of the examination in which the CIED is positioned entirely within the coil. In general, no alterations are made to our MR imaging protocols when a patient with a non-MR imaging–conditional CIED undergoes an MR imaging examination of the neural axis. In fact, any neurologic imaging study that can be run on a 1.5T magnet, including sequences using echo-planar imaging, can be performed in a patient with a CIED, as long as the examination is performed in normal operating mode. This includes diffusion-weighted imaging, perfusion imaging, and diffusion tensor imaging. These factors are independent of the pacemaker device. In contrast to artifacts encountered due to the device generator and leads when performing cardiac or breast MR imaging examinations, no alterations to our scanning protocols were necessary to combat artifacts when scanning the neural axis in patients with a CIED. However, the longer acquisition times used for some sequences when scanning in the normal operating mode (eg, due to longer scan TRs) make some sequences more susceptible to motion artifacts. Comprehensive safety protocol: collaboration between neuroradiology and cardiology. Risk categorization: inappropriate device sensing during MR imaging. Intracardiac electrograms from a patient with a dual-chamber ICD. Electromagnetic interference is seen on both atrial and ventricular channels (solid arrows), resulting in oversensing (dashed arrow) and an inappropriate ICD shock (asterisk). All patients scheduled for an MR imaging examination are screened by the department of radiology at the time of scheduling for the presence of a CIED. If a non-MR imaging–conditional CIED is present, the patient's case is reviewed by a radiologist and alternative imaging is recommended when the radiologist or ordering physician determines that the clinical information needed could be obtained from a non-MR imaging technique. In patients for whom MR imaging is judged to be the most appropriate test, the radiologist makes this documentation in the patient's electronic medical record. Before imaging, the patient is then evaluated by an electrophysiologist (EP) in the same way that patients scheduled to undergo an operation are evaluated preoperatively. If scheduled as an outpatient, a patient with a non-MR imaging–conditional CIED is referred to the cardiac EP clinic, where a physician performs a history, physical, electrocardiogram, and device interrogation. A chest radiograph is performed when there is uncertainty as to the presence of a fractured or retained transvenous pacing lead or a permanent epicardial pacing lead, each of which is an absolute contraindication to undergoing an MR imaging examination (Fig 4). Please refer to Table 3 for a complete list of absolute contraindications for undergoing MR imaging in patients with nonconditional CIEDs. If the patient has no absolute contraindication to MR imaging, the cardiologist discusses the potential risks and benefits with the patient, and the study is scheduled. If scheduled as an inpatient, a patient with a non-MR imaging–conditional CIED is evaluated by the EP consult service in a fashion similar to that in an outpatient. An important point of clarification is for patients who are not awake and alert for the MR imaging examination, such as those who are intubated or heavily sedated. These patients are unable to report pain or discomfort during the examination and are only imaged in circumstances in which the benefits of the procedure greatly outweigh the risk of a complication, which could potentially go unnoticed. Absolute contraindications: chest x-ray examinations with abandoned and epicardial leads. Posteroanterior view of the chest (A) demonstrates an abandoned lead (black arrows) in a patient with a dual-chamber pacemaker device. B, An abandoned right ventricular lead (black arrows) in a patient with a single-lead pacemaker device. The black arrowhead denotes a fracture of the abandoned lead. C, A patient with a biventricular ICD pacing system, which includes transvenous atrial and right ventricular leads and 2 permanent epicardial pacing leads (black arrows). None of these 3 patients would be cleared to undergo MR imaging examination at our institution. On the day of the examination, a staff radiologist obtains informed consent from the patient following a discussion of the risks and benefits of the procedure. A physician or appropriately credentialed EP nurse then performs a complete device interrogation to determine the underlying rhythm and measures baseline sensing, lead impedances, and pacing thresholds. All devices are programmed to an asynchronous pacing mode (DOO/VOO) (Table 1) during imaging in patients who are pacemaker-dependent; this mode is defined as the absence of a spontaneous underlying rhythm of >40 beats per minute. In those who are not pacemaker-dependent, devices may be placed in a mode in which backup pacing is possible (AAI/VVI/DDI) or they may be placed in a mode in which pacing is disabled entirely (OVO/ODO). 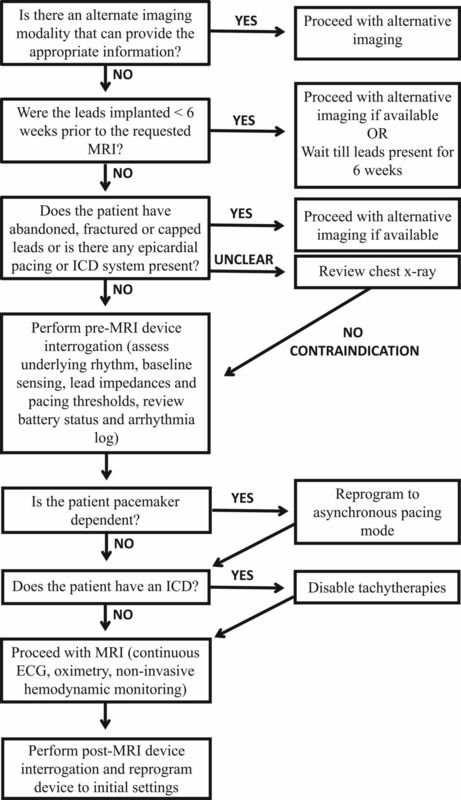 All ICD therapies to treat ventricular tachycardia or ventricular fibrillation are disabled before MR imaging. Continuous electrocardiogram, pulse oximetry, and noninvasive blood pressure monitoring are performed, in addition to patient symptom assessment throughout imaging. Imaging was performed under the continuous supervision of a member of the EP consult team until 2011, when it was determined that the risks in patients who were not pacemaker-dependent were low. Since that time, only patients who are pacemaker-dependent require continuous supervision by a member of the EP consult team during imaging. Patients who are not pacemaker-dependent are currently supervised by a radiology MR imaging technician and a radiology nurse, neither of whom routinely undergo additional training for this procedure. Resuscitation equipment and an external defibrillator with the capability of delivering transcutaneous pacing are immediately available. Imaging is terminated for any adverse events or if the safety of the patient is thought to be compromised. On completion of the examination, a physician or appropriately credentialed EP nurse performs a repeat device interrogation with measurements, noting any changes in device settings, arrhythmias, therapies delivered, or battery depletion. Device settings are reprogrammed to the initial settings if any adjustments have been made previously or modified on the basis of postimaging observations. Patients are then followed routinely in their outpatient cardiac device clinics. Using the electronic medical record of the hospital, we retrospectively identified 292 MR imaging examinations of the neural axis that were performed in 121 patients with non-MR imaging–conditional pacemakers between June 2010 and November 2016. All examinations were performed at 1.5T following appropriate cardiac clearance per the multidisciplinary protocol outlined in the “Cardiac Evaluation” section. Of the 292 MR imaging examinations, there were 162 MRIs of the brain (55%), 26 MRAs of the head (9%), 16 MRAs of the neck (5%), 28 MRIs of the cervical spine (10%), 26 MRIs of the thoracic spine (9%), 32 MRIs of the lumbar spine (11%), 1 MRI of the face/neck, and 1 MRI of the orbits. In patients requiring >1 MR imaging examination, multiple studies were grouped into single patient encounters when possible. In total, 204 discrete MR imaging encounters occurred in this group of 121 patients. Seven of 121 patients (6% of patients with a total of 17 MR imaging encounters) were pacemaker-dependent, 111 of 121 patients (92%) were non-pacemaker-dependent, and in 3 of 121 patients (2%), it was unclear whether the patient was pacemaker-dependent or not. As described in the “Cardiac Evaluation” section, pacemakers were set to an asynchronous pacing mode in patients who were pacemaker-dependent. All MR imaging examinations were completed safely with no clinically important complications reported. No examinations were terminated prematurely due to pacemaker-related problems. There were 8 episodes in 204 total encounters (4%), in which minor, unexpected programming changes occurred with no immediate or delayed adverse outcomes. In 2 patients, MR imaging electromagnetic interference artifacts were noted in the ventricular fibrillation zone; however, no therapy was administered (as noted in the “Cardiac Evaluation” section, all ICD therapies to treat ventricular tachycardia or ventricular fibrillation are disabled before MR imaging). In these 2 patients, no subsequent change in device settings or postprocedural complication was noted following the MR imaging examination. In 1 patient with a dual-chamber pacemaker, there was a minor change in the right ventricular lead impedance, though the impedance remained within normal limits. In another patient with a dual-chamber pacemaker, a slight increase in the right atrial lead capture threshold was managed by a slight increase in the right atrial lead pacing output amplitude. Variations in lead impedance and pacing capture thresholds have been noted previously but are generally deemed to be not clinically important and occur, to some degree, in the general CIED population.40,41 There were noise reversion episodes in 3 patients (multiple episodes in 2 of those patients). In all 3 patients, there were no immediate adverse outcomes, and the device was reprogrammed to the original settings after the MR imaging examination. In 1 patient with a single-lead pacemaker who experienced 6 MR imaging encounters, the pacemaker mode converted to asynchronous pacing with a rate of 100 beats per minute during 1 of the 6 MR imaging examinations. This patient had atrial fibrillation with an underlying ventricular rate ranging from the 40s to the 50s and required pacing 88% of the time. No subsequent adverse outcomes were reported in this patient. No programming changes or other unexpected events were recorded during the patient's other 5 encounters. Our cohort of patients who were safely scanned with MR imaging included those who were pacer-dependent and others who underwent examinations of the thorax. Limitations of this study include the relatively low number of pacer-dependent patients (17/292 confirmed MR imaging encounters) and the general heterogeneity of specific CIED manufacturer generator/lead combinations. In addition, no pediatric patients were scanned at our institution, and no patients were scanned at field strengths of >1.5T. On the basis of our experience during the past 6 years performing MR imaging examinations in patients with non-MR imaging–conditional CIEDs, including those who are pacemaker dependent or are undergoing an MR imaging of the thorax, as well as the growing body of supportive evidence in the literature, it is our opinion that these examinations can be performed safely when risks to the patient are well-managed. Before proceeding with an MR imaging examination, it is important to confirm that doing so is judged appropriate following a thorough review of the patient's chart and a discussion with the ordering physician by the supervising radiologist. Strict adherence to basic screening and scan protocols is also required. Patient populations that should continue to be excluded from MR imaging include those with devices implanted <6 weeks prior, those with retained or fractured device leads, those with surgically placed permanent epicardial pacing leads, and those with temporary intracardiac/epicardial pacer devices with the external generator still attached. The authors thank Charles Fasanati for his help in preparing this article. Disclosures: Jeremy D. Collins—UNRELATED: Consultancy: Guerbet, Comments: advisory board meeting; Grants/Grants Pending: Siemens, Comments: Conebeam CT grant for hepatocellular carcinoma. Bradley P. Knight—UNRELATED: Grant: Medtronic, Boston Scientific, St. Jude Medical, BIOTRONIK*; Consulting Fee or Honorarium: Medtronic, Boston Scientific, St. Jude Medical, BIOTRONIK. Alexander J. Nemeth—UNRELATED: Grants/Grants Pending: National Institutes of Health, Comments: RO1HL092259, SP0039078, coinvestigator 5% effort salary support for Cerebral Autoregulation Monitoring to Reduce Brain Injury from Cardiac Surgery. *Money paid to the institution. OECD. Magnetic resonance imaging (MRI) exams, total. Health: Key Tables. OECD 2014. https://data.oecd.org/healthcare/magnetic-resonance-imaging-mri-exams.htm. Accessed December 24, 2016.